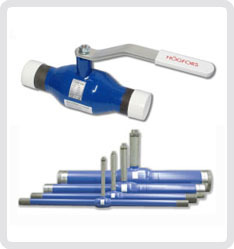 Hogfors manufacture an extensive range of ball & Double Offset butterfly valvesfor district heating and district cooling applications within co-generation (combined heat& power) systems, available in carbon and stainless steel the valves are designed for durability to provide low life time costs. Valves are manufactured in Finland with 80% of its production exported to diverse markets including Russia and China where large systems are in use. Hogfors largest ball valves are currently 800mm nominal bore and their largest butterfly valves are 1400mm nominal bore ! Ball valves have PTFE seats while butterfly valves can be specified with PTFE or metal seats, end connections can be weld, flanged or wafer. Standard specials include extended stems for buried service and balancing valves.